Hopefully this isn't boring everyone too much, can someone check if these expressions are correct? There are few I just don't know, so I've left them blank. пакет/ёмкость замороженных фруктов - these are sold in thin plastic 'boxes' inside a plasic bag... пакет or ёмкость? Also, its mostly berries, so maybe фрукты-ягоды?
? oven hob ring - I think I looked this somewhere then forgot it, can't find it anywhere. отмываю кастрюлю от остатков супа. OK, but I’d say отмеряю. пакет/ёмкость замороженных фруктов - these are sold in thin plastic 'boxes' inside a plasic bag... пакет or ёмкость? А plastic box is ёмкость or контейнер. A plastic bag is пакет. Also, its mostly berries, so maybe фрукты-ягоды? One can say also 'I open the bottle', right? In Russian, it would sound more natural, then "я открываю бутылку". The extra reading on упаковка! Great, thanks both, plenty to learn from there. No idea why I though 'положил немного воды в кастрюлю' was right, it looks silly to me now, as if water is a thing I can pick up and move around on its own. Yes, less waste. Don't like leaving food uneaten. I know how much is enough! Never heard 'шестёрка' before; is that used a lot in speech? 'банан недозрелый, но пойдёт.' Is 'это хватает' wrong, or is 'пойдёт' just better, more natural? I haven't heard it used like this before. 'One can say also 'I open the bottle', right?' Yes, my version was just bad English turned into bad Russian. 'упаковка' sounds like a useful word for when shopping, not everything comes in a 'пакет' afterall, and 'ёмкость' seems to be the sort of thing you buy and keep, not throw away when it's empty. 'пачка' in google image search turns up lots of ballet dancers in tutus. What a versatile word! Я отодвинул кастрюлю в другое место стола. Я переставил кастрюлю на столе. перемещать and столешница are correct words, but not colloquial ones. Перемещать is too general while столешница is too detailed. Хватает / хватит usually assumes quantity. These words have several meanings. They can be used to denote a group of n objects. E.g. Большая Семёрка ‘G7 summit’; тройка ‘troika, three-horse team’. This meaning is rather bookish. Another meaning, used a lot in both literary and colloquial speech, is ‘a figure written out’. большая синяя единица — a big blue ‘1’. Число зверя — три шестёрки — The Number of the Beast is three 6’s. In particular, these words are used for school marks. (We have a five-mark grading system in Russia, пятёрка being the best and единица (also known as кол for its shape) the worst mark). 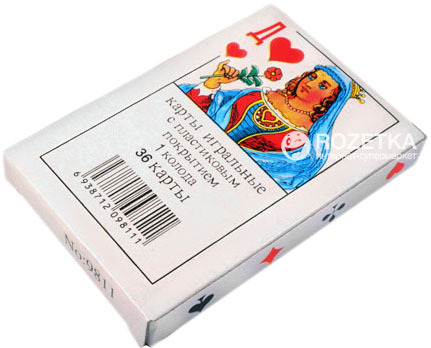 Playing cards (2, …, 10) are called двойка, …, десятка. E.g. шестёрка червей ‘6 of hearts’. OS Windows 7 — «семёрка», Windows 8 — «восьмёрка», Windows 10 — «десятка». Car model ВАЗ-2106 — «шестёрка», ВАЗ-2107 — «семёрка», ВАЗ-2109 — «девятка» etc. 'Шестёрка' also has criminal slang meaning: 'servant/jackal/toady' (scornful connotations). That is low rank criminal/vandal obsequious obeying commands of his master. Like in 'ты же не его шестерка?'. I didnt know it had criminal connotations, although I had read that it was derogatory. Its a useful one to know nonetheless. Aces are strongest cards and sixes are the lowest. That is why this term was born in the places where cards and guns matters. Why a 36 card deck? Is it some sort of superstition? I think 36 cards were more suitable for popular games in Russia. You can buy 52/54 decks of course, but most of russians throw out 2-5 cards from it.